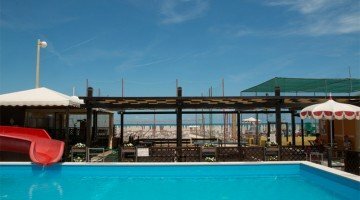 The Golf Hotel in Cattolica is a 3-star family-run hotel located near the beach. It has free car parking at 700 m with free shuttle, garage for motorbikes and bicycles, services for children. It is equipped for cyclists and admits small and medium-sized animals. 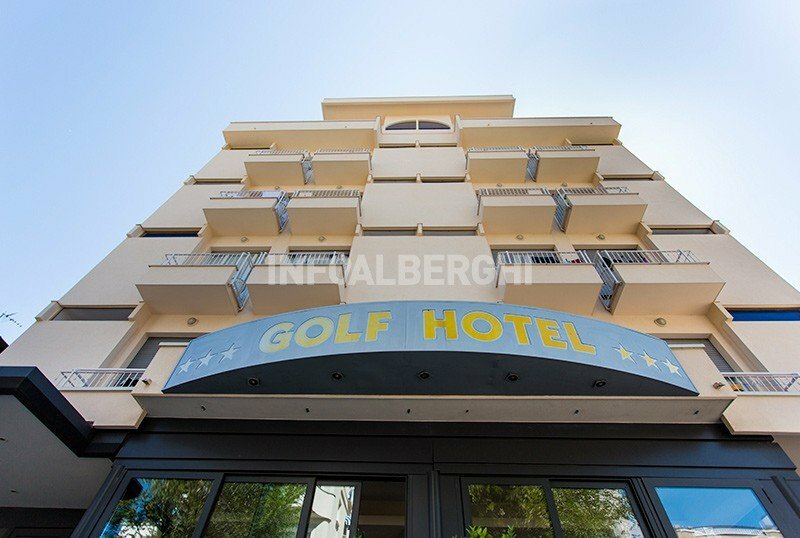 The hotel is located in Cattolica in the central area, close to the beach and 5 minutes walk from piazzale 1 Maggio, known for its dancing fountains. The Cattolica Aquarium can be reached in about 15 minutes. All rooms are air conditioned and have a balcony, bathroom with shower and hairdryer, telephone, WI-FI, safe, satellite TV, safe and minibar (on request). Some rooms have a sea-view terrace. Panoramic terrace, free bicycles, elevator, laundry service, daily newspapers and beach towels, theme nights. It is equipped for cyclists. PARKING: covered, free and guarded at 700 m with free shuttle service from 7:00 to 3:00; free garage for motorcycles and bicycles. AIR CONDITIONING : present and free both in the common areas and in the room. AGREEMENTS : beach, discos, amusement parks, gym, swimming pool. Possibility of organized excursions. PETS : small and medium size admitted. BREAKFAST : international buffet breakfast with home-made cakes and pies, cheese, eggs and cold cuts. LUNCH AND DINNER : 3-choice menu with traditional Romagna meat and fish dishes, followed by a buffet of vegetables and appetizers. Pasta and homemade desserts. Drinks included with meals in full board plus. VARIATIONS : vegetarian cuisine. On request, dishes for vegans and coeliacs. OTHER: every week, Romagna evening to taste the typical features of the territory. In the hotel: indoor playground area, strollers, pediatrician, babysitting service during meals. At meals : high chairs, baby food, baby food, baby menu, kitchenette for mothers, bottle warmer. On the beach : playground area, entertainment, children's pool. The hotel has an agreement with Bagno 68 and Bagno 75. Swimming pool with waterslide, gym, playgrounds, entertainment for adults and children, evening parties are available in Bath 68. Bagno 75 (La Playa) has swimming pools, entertainment, a wellness area, a playground and entertainment services. Prices are per person per day, for a minimum of 3 nights, with full board treatment plus drinks. Take advantage of our all-inclusive offer! Stay in a 3-star hotel, well-appointed rooms with balcony, equipped with all comforts. Rich sweet and savory breakfast buffet. Lunch and dinner with 3 choice menus and buffet of appetizers. Unlimited drinks with meals included. Bicycles for free use to visit the city and free Wi-Fi throughout the hotel. Unmissable cooking class: you'll learn how to make passatelli, ciambellone and piadina romagnola! From € 45 per day per person.